On this week’s episode, Harley and Brett kick off summer right with a trip to Uncertain, Texas. Yes, we are sure. Harley had a great interview with Ken Gerhard, a cryptozoologist and field investigator for The Centre for Fortean Zoology. 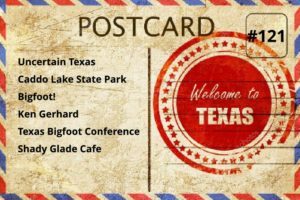 We discuss the Caddo Lake State Park Bigfoot and the similar sightings in the area including some outings with Lyle Blackburn and the Fouke Monster. What can you do to increase your chances of a Bigfoot encounter? What is the Devil’s Elbow? What project is Ken working on? Need more Bigfoot? The Texas Bigfoot Research Center runs the Original Texas Bigfoot Conference just down the road in Jefferson, TX. Check it out and you just might meet. Bob Gimlin, Dr. Jeff Meldrum, Lyle Blackburn, Ken Gerhard, Nick Redfern, or Shelly Covington-Montana. The Shady Glade Cafe may be the only restaurant around, but that hasn’t stopped them from making some crazy good country cookin’! The Top 5 is bigger in Texas.